Holding of the Egg was created as a 5″ x 5″ mini print a few years ago and has always been a strong prospect for a full size print edition. Well, that time has come for our friend with the egg and tomorrow he will be available as a 10″ x 10″ edition of 100 on a dark blue shimmer paper stock for $30. Meet us at the Shop on Wednesday, April 30th around noonish PST to attempt to purchase Holding of the Egg. We also found a small amount of Bliss Bug mini prints from a few batches ago, so be on the look-out for a limited amount of those as well. 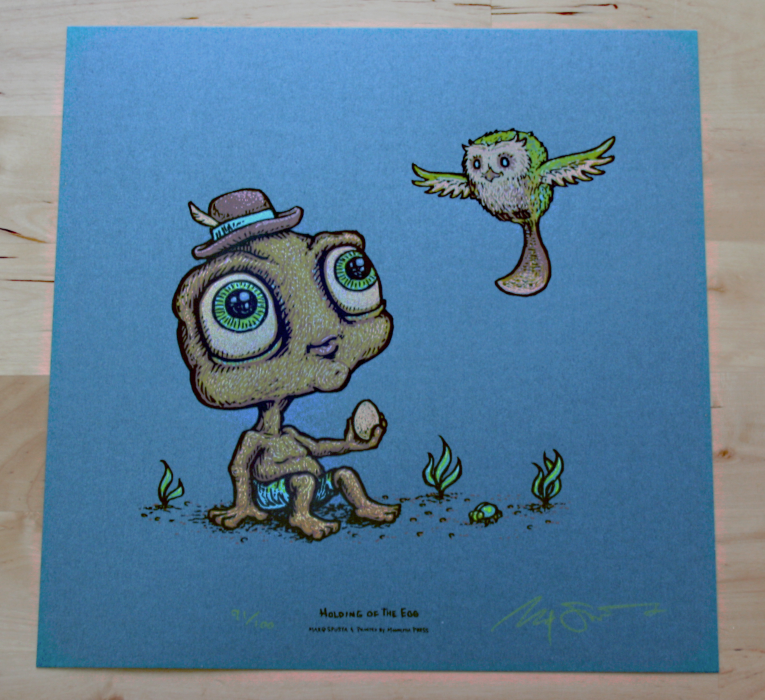 Both the Holding of the Egg and Bliss Bug Mini Print Packs will have a limit of 1 per customer. The limit of one per customer applies all day, or until your order is shipped. There will usually be a limit of 1 per customer on all prints and print packs, so don’t order multiples unless it states a higher limit. To all those with outstanding orders from last week, sorry for the delay in the shipping of Carting Along and Flibflums. We ran out of some important shipping supplies and haven’t been able to get those out yet, so we would like to combine the orders from both weeks sales into one big batch of shipments. For those of you that place an order this week, and ordered last week, your orders will be combined into one package. Use the discount code “comboship” when placing 2nd and 3rd orders and you won’t be charged the for additional shipping. If there are double shipping charges, we always compensate by tossing in extra Spusta goodies into the orders. sounds like a great day to take an extra long lunch break! Thanks so much for the endless amount for hard work!! 2 great drops! Blocking off the 2 O’clock hour now. oh looks great Marq. I’ll be looking to hatch an Egg tomorrow. Will they be dropped together or separately? Just wondering. Thanks for continuing to release awesome art!! Can’t wait until 3pm! Love this, hope to score !! Going in daughter’ room for sure if I do !! Keep em coming…..
Rainy humpdays aint so bad when Marq is dropping prints. Nice !! I don’t have a Holding of the Egg ! So hope to be successful !! Love it !! Shop was running slow, but now it’s ready to go. The egg is about to drop. Are any more Bliss Bugs going to drop? And thanks for the Holding!!!! Never even saw the holding on the prints and poster page. is that it for today….any chance for a later drop also….they were gone so fast! Sorry, those went too quick! That’s the only drop for today. Better than nothing! Hoping for a variant to make me feel better about missing those Bliss Bug prints. Thanks for all the hard work!!! I had a Bliss Bug in my bag but when I went to check out it said it was out of stock. SIgh…. Maybe a bliss bug with eye’s wide open will help me with drops in the future.. Thanks for the Humpday fun!! All you Rock! !